Media players are a necessary evil – a way to show content on your Windows PC. If you regularly download and show content, chances are you’ll have something else on your computer aside from the standard and rather limited Windows Media Player. Still whining about that Windows Media Player has been shown the door of Windows 10 OS? Still pissed off that Windows Media center was no longer part of Windows? But which is the best media player for performance? And which media players are simply too slow to show HD videos without sending your PC into meltdown. 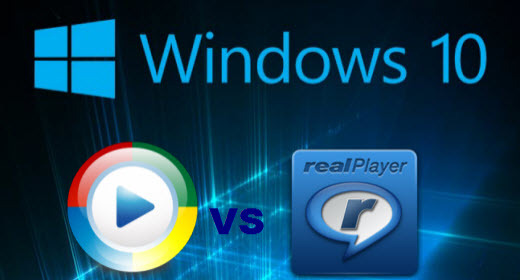 Don’t be vexed, cuz the two free media players for Windows 10 will be introduced in this article, you just need to take a deep look into this review between Windows Media Player VS. RealPlayer and find out which Windows 10 media player is the best to manage and play your media files on your Microsoft Windows 10 PC. This media player for Windows 10 is compatible with numerous container file formats inclusing MP3, MP4, QuickTime file format (.mov, .qt), Windows Media format (.wma, wmv), and the proprietary RealAudio (.ra, .rm) and RealVideo (.rm, rv, rmvb) formats. Windows Media Player is a popular free inbuilt media player from Microsoft for Windows. You can play music, video, pictures, and recorded TV on your system. You can also sync your media to a portable device. It is simple in design and you can change its user interface by downloading various skins from the internet. You can burn your CDs and DVDs right from your media library. Content Management Full media library, Automatic album art retrieval, Create and manage playlists, Trim videos (head/tail), Save still picture from videos, Convert audio and video for playback on over 100 major devices Full media library, Automatic album art retrieval, Create and manage playlists. Save still picture from videos. SYNC converts audio and video for many devices. Note: After 25 years of development, you might think Windows Media Player should have the power to handle all your video and audio needs. And yet, as you’ve probably noticed, it’s extremely limited, and won’t even play some common file types. If you are a diehard Windows 10 user who wants to find the most compatible media player for Windows 10, the answer is listed above. If it’s possible, you can try them one by one to find out what do you want the most. You can Also Choose other free media Players for Windows 10. KMPlayer – A Basic Media Player for Windows 10. KMPlayer is another choice of Windows 10 media player. With KMPlayer, you are able to play any mainstream media files because this free media player for Windows 10 has its own internal codec which makes it supports MPEG 1, MPEG 2, AAC, WMA, OGG, ect. Media Player Classic – A Windows 10 Media Player Alternates. Media Player Classic is a light-weight media player for Windows 10. Looks like Windows Media Player from the appearance but added more bells and whistles. This Windows 10 media player alternates has built-in codecs for MPEG-2 and LPCM, MP2, AC3, it supports DTS audio and it’s also a full-fledged DVD player software on Windows 10 in 2016-2017. Such situations may occur if you made a video in one different format but want it to be in a different format so that you can play them on various devices. Another reason might be that you do not have a specific video player and the format in which your video is, it is not supported by the video player, such as Windows Media Player & RealPlayer. So it’s very essential in today’s digital era to have the convenience of easily converting videos from one format to another, the problem then arises as to what the solution exactly is. Pavtube Video Converter Ultimate <review> is the answer to all your video related problems. So what exactly is EaseFab Video Convertor you ask? Well, it is nothing but an amazing collection of features and tools that let you convert videos as easily as you can imagine. However, EaseFab Video Convertor is much more than just a simple convertor. Let us see what other amazing features does this piece of program has to offer. So first and foremost, the primary feature of this program is that it converts videos. However, the magic lies in the way it does that. With Pavtube Best Video Converter for Windows 10, you can convert videos into almost any format you can think of such as WMV, MP4, MOV, MKV, AVI and much more. You can convert HD videos as well. Pavtube Video Converter Ultimate allows various kinds of users to use the program easily. No special skills are required. Whether you are a beginner or an experienced user, you will find it easy enough. If you need to edit your videos before converting them to other formats, you can do that with Pavtube Video Converter Ultimate. You can also trim. crop, add watermarks, add effect to your videos freely. Device Profiles iPhone, iPad, iPod, Android, Windows Phone/Tablet, Kindle Fire, TV, Xbox, PS4 etc. iPhone, iPad, iPod, Apple TV, Android. Customized presets are available. After download, you can refer to the step guide on >> Play HD Video Movie on Windows 10. So, enjoy your favorite videos on Windows Media Player and RealPlayer etc. Find out which media player is the top choice for you. How to View iTunes Movie via XBMC?